Jesus Christ chose twelve apostles and taught them with particular care. The apostles in turn passed His teachings along to the people. As time passed, short creeds containing these truths were written to combat false teachings and to summarize what one should believe if he is to be baptized a Christian. In the 4th century, the Church decided to compose one unifrom official creed. The Bishops met in ecumenical council, first in Nicea and then in Constantinople, and established what is today called the Nicene Creed. The creed was placed in the Divine Liturgy in the 5th century to assur that there be no deviations from the true faith. Because it is important not only to have faith but also to believe so deeply that we want to share that faith with others, the creed is recited aloud by congregation. 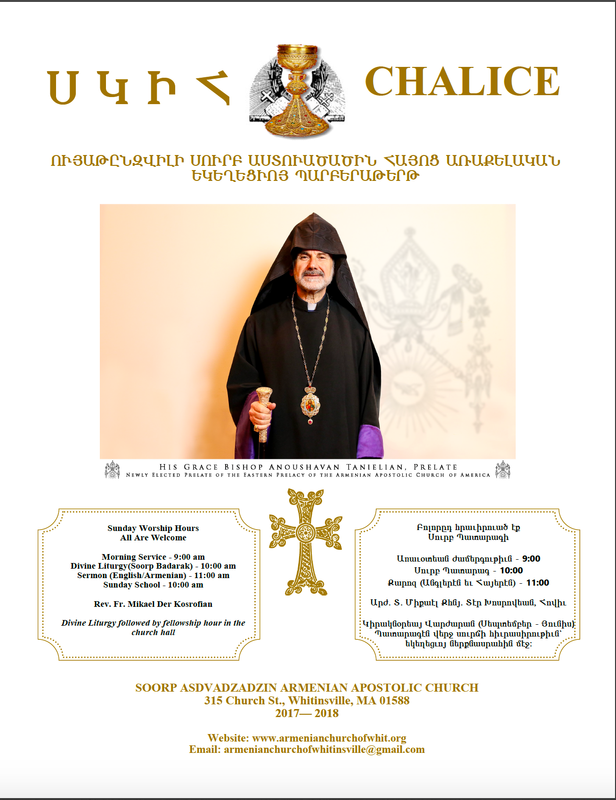 The Nicene Creed reminds us of the facts we must know and believe as Armenian Apostolic Christians. We believe in one God the Father almighty, maker of heaven and earth, of things visible and invisible. And in one Lord Jesus Christ, the Son of God, begotten of God the Father, only-begotten, that is of the substance of the Father. God of God, light of light, very God of very God, begotten and not made. His is the self-same nature of the Father whom all things came into being in heaven and on earth, visible and invisible. Who for us men and for our salvation, came down from heaven and was incarnate, was made man, was born perfectly of the holy Virgin Mary by the Holy Spirit. By whom He took body, soul and mind, and every­thing that is in man, truly and not in semblance. He suffered and was crucified and was buried, and rose again on the third day and ascended into Heaven with the same body and sat at the right hand of the Father. He is to come with the same body and with the glory of the Father to judge the quick and the dead, of whose kingdom there is no end. We believe also in the Holy Spirit, the uncreated and the perfect; who spoke in the Law and in the prophets and in the Gospels. Who came down upon the Jordan, preached in the apostles and dwelt in the saints. We believe also in only one catholic and apostolic (holy) Church. In one baptism, with repentance for the remission and forgiveness of sins. In the resurrection of the dead, in the everlasting judgment of souls and bodies, in the kingdom of heaven, and in the life eternal.